Waterborne acrylic enamel paint. Distinguished for its long lasting, excellent whiteness. It does not yellow over time. Apply it safely on surfaces already painted with solvent based enamel paints. Works easily and spreads evenly on surfaces without creating brush or roller marks. It has great performance and coverage. Its application creates a flexible surface with great resistance and durability to adverse weather conditions, frequent washing and chalking. Ideal for children rooms, schools, and hospitals because is odorless and environment friendly. 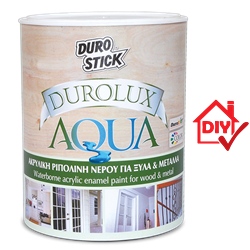 Suitable for painting all wood and metal surfaces. Use the DUROCOLOR system (liquid pigments in 20ml syringe packaging) to create 120 LIGHT colors. 1lt/10-13m² per coat, depending on the painting conditions and application method.